3rd August, 2012, Washington, DC: The award-winning interactive exhibition, 1001 Inventions, arrived in the US capital today, introducing brand new audiences to the Golden Age of Muslim Civilization. The ground-breaking scientific and cultural achievements of this era, from the 7th to the 17th centuries, will be introduced to visitors to the National Geographic Museum for six months, starting this summer. “1001 Inventions: Discover the Golden Age of Muslim Civilization” is a blockbuster traveling exhibition that highlights the enormous contribution to science and technology made by men and women of many different faiths and cultures who lived in Muslim Civilization. The exhibition opened on 3rd Aug. 2012 and runs through 3rd Feb. 2013. 1001 Inventions is a global brand that promotes awareness of scientific and cultural achievements from the ‘Golden Age’ of Muslim Civilisation and how those contributions helped build the foundations of our modern world. The 1001 Inventions exhibition was named the Best Touring Exhibition of the Year at the Museums and Heritage Excellence Awards in 2011. This highly interactive exhibition showcases the historic advancements in navigation, medicine, hydraulics, optics, mathematics and more. 1001 Inventions has drawn millions of visitors at blockbuster residencies in London, Istanbul, New York and Abu Dhabi. A further 500,000 people saw the exhibition at the California Science Center in Los Angeles, where it closed in late April. The 'Global Strategic Partner' for 1001 Inventions is Abdul Latif Jameel Community Initiatives, which has sponsored the exhibition and its international tour. Centerpiece of the exhibition is a model of celebrated Ottoman engineer Al-Jazari’s sophisticated ELEPHANT CLOCK, created more than 800 years ago. The clock was a masterpiece celebrating the diversity of humankind and incorporating features from Indian, Egyptian, Greek, Chinese and Arabian cultures. The clock cleverly reflected cultural and technological influences from across Muslim Civilisation, from Spain to China. "The mission of National Geographic is to spread knowledge of the world and its cultures — past and present," said Kathryn Keane, Vice President of Exhibitions at the National Geographic Society. "This exhibition is an opportunity to share the fascinating history of Muslim civilization with our audiences and to celebrate great scientific achievement and innovation." The exhibition also features energy-efficient houses constructed more than 1,500 years ago. The houses incorporated natural cooling elements in their design, such as double-glazed windows, thick external walls and air-scoops for natural cross ventilation. Illustrations of the various houses are highlighted throughout the exhibition to show how our current energy-efficient houses use this same technology today. The work of influential scientists, such as physicist Ibn al-Haytham, is featured in the exhibition. Al-Haytham’s ideas about optics overturned the ancient theory that our eyes send out invisible rays in order to see. He proved his theory of light rays being reflected from visible objects to build the first camera obscura. The exhibition includes camera obscura examples and other advancements in optics, showing how early people came to understand the complex concepts behind vision. In addition to these larger-scale inventions, 1001 Inventions features many everyday objects that many do not know were invented by the men and women of the medieval Muslim Civilization. Items such as perfume, fabrics, chess games and more are featured to show visitors the importance of past inventions on our daily lives today. In conjunction with the museum exhibition, the National Geographic Museum will host the 1001 Inventions Family Festival on 8th Sept. 2012 from 10am to 4pm. This outdoor festival will include performances, music and dance workshops, hands-on art activities, tastings, demonstrations and a craft bazaar. In addition, admission to the museum will be free all day. The festival is supported by a grant from the Doris Duke Foundation for Islamic Art. 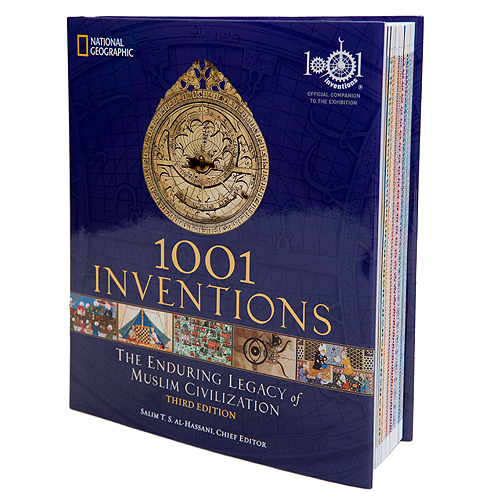 National Geographic Books recently published the companion book to the exhibition, “1001 Inventions: The Enduring Legacy of Muslim Civilization”, that delves into some of the most important inventions from the period. 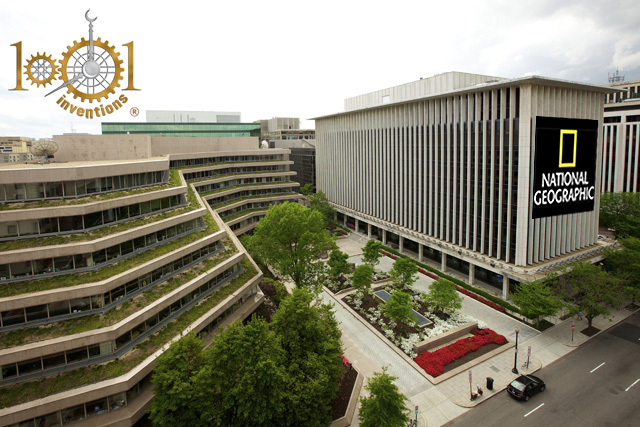 National Geographic Museum, 1145 17th Street, N.W., Washington, D.C., is open daily from 10 a.m. to 6 p.m. It is closed Dec. 25. Admission is $8 for adults; $6 for National Geographic members, military, students, seniors and groups of 25 or more; $4 for children ages 5-12; and free (reservation required) for school, student and youth groups (age 18 and under). Tickets may be purchased online at www.ngmuseum.org/1001. 1001 Inventions is a leading and award-winning international science and cultural heritage brand reaching over 50 million people. The Muslim civilisation stretched from Spain to China. From the 7th century onwards, men and women of different faiths and cultures built on knowledge from ancient civilisations, making breakthroughs that have left their mark on our world. 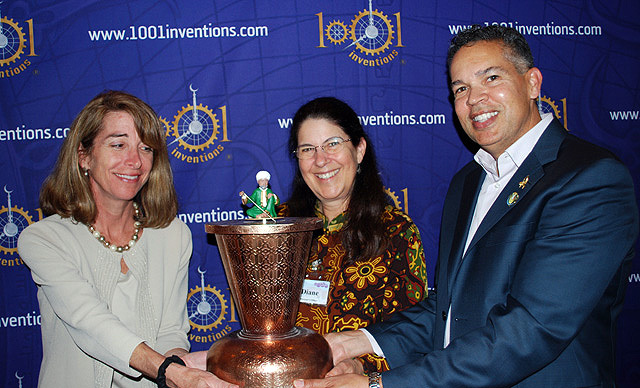 1001 Inventions is supported by the UK-based Foundation for Science, Technology and Civilisation, an international network of academic experts, as its Global Knowledge Partner. Additional support comes from the Abdul Latif Jameel Community Initiatives, philanthropic arm of the ALJ Group of companies, which serves as the Global Strategic Partner of 1001 Inventions. 1001 Inventions is based on two decades of research by more than a hundred leading academics and educationalists from around the world. The content of the 1001 Inventions exhibition was reviewed and approved by an independent panel of academics from the London Science Museum and was also reviewed by academic experts retained by California Science Center.